Walkways are integral to daily life. These pathways are commonly traversed when leaving the house for work, taking a stroll, or going for a short jog. Their basic purpose is to direct people toward areas they would like to explore. Guests are guided to the entrance of a home, to the pool area, backyard garden, or any other point in a landscape. Walkways provide a very practical function, and it certainly makes sense to enhance its overall structure to achieve a warm and welcoming appeal. Installing walkway pavers is the much needed solution to improve the look and efficiency of a muddy beaten path. Several materials are available for paving and these are classified into three main categories: a) concrete pavers; b) natural stone pavers; and c) brick pavers. Concrete and brick walkway pavers are manufactured products that can be tailored to suit customer preferences. They have a wide selection of sizes, colours and shapes to complement different paths. Natural stone walkway pavers, on the other hand, are fashioned by natural forces. They typically have limited colours and shapes yet they bring about an authentic feel of the outdoors. Residential walkway paving and commercial walkway paving are the main applications of walkway pavers. For residential spaces, trails leading to the home entrance, garden, pool area and patio area are typically covered with coloured bricks to evoke a sense of serenity and order. In commercial spaces, geometrically patterned pavers find their way in scenic pathways throughout parklands and historical places; entrance and exit of shopping centers and carparks; and along beaches. They give an overall sense of harmony amidst the mundane chaos in public and commercial places. Aside from the aesthetics, there are other benefits of utilizing walkway pavers. Coloured pavements highlight designated lanes to effectively guide pedestrians to the proper walking area. That way, people can avoid stepping on ornamental plants and grass, preserving their natural beauty. Covered walkways have textured surfaces that prevent slipping. These are also stable, level surfaces that protect visitors from dirt and mud. In the winter season, pavers facilitate easier removal of snow. Walkways are indeed a part of daily life. Along these paths, fond memories have been formed and shared among people: going on a first date, hosting reunions, receiving a good news, welcoming a new family member are some. 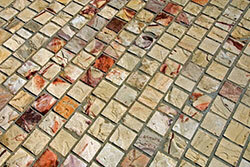 Create a more inviting and warm ambiance in your home or establishment with walkway pavers. Americans everywhere — from California to New England, from Texas to Minnesota — are spending more time at home and more time outdoors. A concrete patio can be a great place to spend time. Back yards are being transformed into luxurious extensions of the house. They’re the new favorite room to relax, entertain, and cook. And the heart and soul of the backyard resort area is the concrete patio. The Hearth, Patio, and Barbecue Association, which recently held its annual tradeshow and exposition, says the growth of the outdoor living phenomena is the result of North America’s interest in ‘cocooning,’ the trend toward a more casual lifestyle, an aging population and the popularity of porches, decks, and concrete patios in homes. The swimming pool industry sees that trend, too. In fact, pools are getting smaller and are playing a less dominant role in the back yard. The Pool and Spa Institute says the pool is just one amenity — an increasing number of homeowners are going all out with outdoor kitchens, furnished seating areas, fireplaces, decorative concrete patios, pizza ovens, elaborate water features, and more. Homeowners want to enjoy their homes, but they also see upgrading their back yards and adding walkway pavers as an investment.